Being a referee is easy. Just ask any player, supporter or especially a TV pundit. I hold my hands up and admit that I was that player and I'm still that supporter as the Hibees are denied yet another blatant penalty. That was until donning the black jersey and taking up the whistle. As an aside, my whistle, until recently, was my train driver father's which sent the odd departure off from Dalmally a tad early. Shinty has been good to me. I was a late convert only taking up a caman at Edinburgh University before progressing on to Tayforth, where I was surrounded by very many good players as we established ourselves in the old South Division 1. Our greatest achievement was probably winning the Aviemore indoor sixes which, although seeming like yesterday, is now 30 years distant and us old timers are even talking about holding an anniversary do. In those days playing a team from the North was always a big event. In 1989, we reached the dizzy heights of the Camanachd Cup semi-final where we thought our square shaped attack formation [yes, there are tactics in shinty] would see for the somewhat primitive Northern diamond of our opponents. We could even afford to switch tactics at half-time when at 10-0 down, with Kingussie running out of ideas, they ended up rather fortunate 11-0 victors. I stopped playing when the National Divisions came in and then received a fateful phone call asking if, as a one-off, I could referee a game. No problem thought I. Now, 14 years on, I may have changed my opinion on how easy it is but I have enjoyed officiating immensely and have now refereed all the major cup finals [with the exception of the MacTavish] and the internationals. I envy football referees - small pitch, an offside rule that concentrates play into a narrow area and a large ball. Compare that to shinty's 180 x 80 metre pitch [I often cover 10 km in a game despite accusations of never getting out of the centre circle], with 24 players spread out, a tiny little ball that can travel 100m in an instant, and all with an expectation that the poor old ref will be everywhere at once. As a minority and community-based sport there is the double edged sword of everyone knowing everyone else. This leads to great local, and not so local, rivalries which can get overheated at times and there are often accusations of clubs acting in their own interest rather than for the greater good of the game. However, this can also be a strength, in that there is a clearly signposted and democratic route to bring about change through proposals to the Camanachd Association. The people who can, and do, discuss these changes are those involved with the game: players, coaches, referees and spectators. 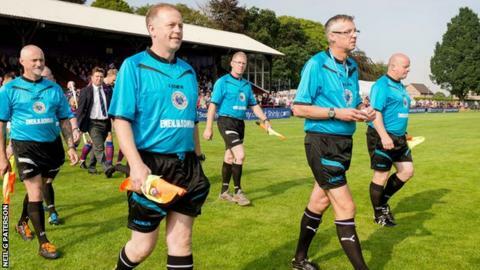 As a member of the Camanachd Referees' Association I feel we should have an input into putting forward suggestions for change. The clubs, quite rightly, have the biggest say although no-one will deny that it is difficult to come up with the right formula. There seems to have been a recent revival towards supporting a move to reverting to North and South areas. It is a long way from Bute to Skye! Equally, the Premier Division has undoubtedly been instrumental in improving standards. One hot topic at the moment is appeals against red cards and I see no reason why this should not be put forward for adoption. Players make mistakes, referees make mistakes, and if there is a mechanism in place for putting this right then so be it as long as it is not exploited to allow key players to feature in big games. Stopping televised matches while we go to a TMO works well in cricket and rugby but I like to see shinty flow as much as possible, which is part of its beauty. TV coverage for shinty on BBC2 and BBC Alba is now excellent and the spin-offs Caman and Shinty WAGS also spring to mind. But occasions like the Camanachd Cup final would lend itself to a wider audience, even south of the border. What was not to like about the wildly exciting Kyles 6-5 Inveraray final in 2012 compared to the utterly boring Mayweather v Pacquiao fight? Neutral goal judges. There are currently very good volunteers who can be totally relied on to be objective but they can come under pressure from both the opposition and indeed their own team. Advance a free hit 10m for dissent. Have a 10m centre circle which only the two centres can enter at throw-ups. Allow shies to be taken with feet on the touchline. Respect from and to the referee, I have already said that we all make mistakes! Remember, there is an advantage rule; a free hit to the attack is often of little benefit. To end, my game was cancelled last weekend due to the tragic loss of Jamie Kerr following a marine accident; a Lochside Rovers player taken far too early. My thoughts and that of the shinty community go out to his family, friends and team mates at this sad time.